There’s a lot to love about San Francisco. This north Californian city celebrates every ingredient in its melting pot of history, culture, glamor and natural beauty. Enveloped by the Pacific Ocean, the San Francisco Bay, and of course its famous all-year fog, are the city’s iconic landmarks and neighborhoods. The Golden Gate Bridge, quaint and vibrant Victorian houses, charming cable cars, the impressive Transamerica Pyramid skyscraper, and myriad museums, theatres, shopping streets and sprawling greens, come together in an eclectic and irresistible symphony. For a fabulous San Francisco experience, choose from our pick of the best San Francisco hotels that’ll guarantee you a memorable stay. Check into Fairmont Heritage Place Ghirardelli Square to experience San Francisco at its stylish, charismatic, and authentic best. This landmark hotel gets everything just right – from its near-perfect location overlooking the marina, to its enchanting ambiance of leisurely luxury. Set in the premises of the former Ghirardelli chocolate factory, this upscale apartment-style hotel is surrounded by boutiques and restaurants, and well connected to quintessential San Francisco landmarks including its historic cable car network, the Golden Gate Bridge, the Embarcadero, and the Exploratorium science museum. Guests at Fairmont Heritage Place can holiday in spacious comfort, thanks to the hotel’s 53 luxury suites. These range in size from 1- to 3-bedroom setups, beautifully balancing original brickwork and hearth framed fireplaces, with contemporary fittings and fantastic bay and city views. The suites are also equipped with gourmet kitchens, spacious lounges and dining areas, designer linen and toiletries, and a fine range of appliances and gadgetry. Service at Fairmont Heritage Place matches its ambiance and amenities. From complimentary breakfast and wine-and-cheese receptions, to catered events and made-to-order meals prepared by your personal chef, there’s more than enough here to make you feel pampered. You are also entitled to chauffeured town cars, 24-hour butler service, efficient housekeeping, gym facilities, and in-room spa treatments. For anything else that you wish to indulge in, the area around the hotel is abuzz with options. Hotel Drisco enjoys one of the most exclusive addresses in San Francisco, and echoes the same degree of sophistication in its ambiance, amenities and services. It operates out of an elegant Edwardian building located amid the stately mansions and tranquil environs of Pacific Heights. 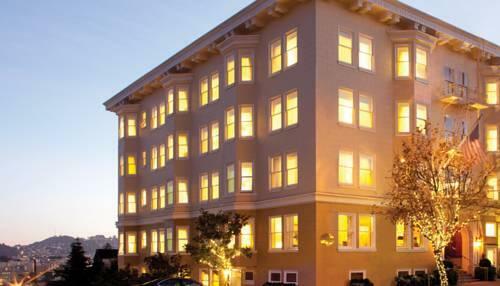 The verdant Presidio Parklands are a short stroll away, as are the upscale boutiques and restaurants of Fillmore Street. Guests at Drisco can unwind in luxurious comfort, away from the busier segments of San Francisco. The hotel’s charming interiors extend a warm welcome while simultaneously exuding quiet sophistication. Plush furniture, rich fabrics and a classic wooden reception desk set the tone for Drisco’s famously timeless elegance. The 48 rooms upstairs are spacious, classic and comfortable, flaunting Egyptian cotton linen, Bvlgari amenities, marble bathrooms, and furniture and gadgetry optimized for both work and relaxation. Premium rooms offer city views and sitting areas. The lack of air conditioning is hardly noticeable, and more than made up for by complimentary amenities including a delectable breakfast buffet, a candlelight wine-and-cheese reception every evening, plus fitness center passes and a well-stocked movie library. Guests can also borrow bicycles at no extra charge, or book a chauffeured car for their weekday morning meetings. Room service is available round the clock. St. Regis is an upscale modern high-rise hotel that places you in the heart of San Francisco’s trendy SoMa neighborhood. The Yerba Buena Center for the Arts and the San Francisco Museum of Modern Art are right by the hotel building. 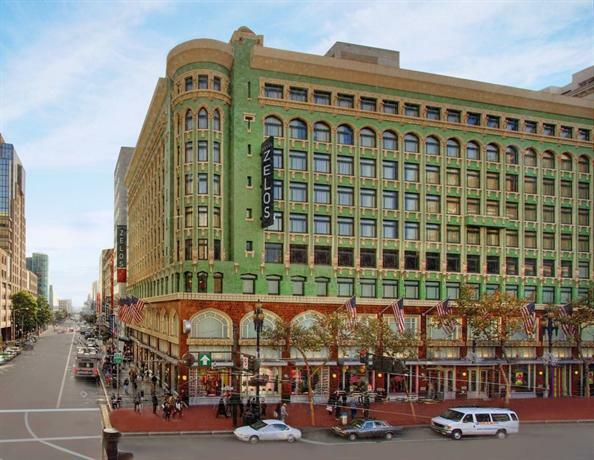 Market Street is minutes away, as are train stations, shopping destinations, and a range of restaurants and bars. Taking a leaf out of SFMOMA’s book, St. Regis houses its own modern art collection, showcasing it in an atmosphere of opulent yet understated glamor. 306 spacious, sunlit guest rooms and suites occupy 20 floors, and feature soft earth tones, marble and wood finishes, chaise lounges, and bathrooms with rainfall showers and soaking tubs. Premium rooms offer views of the San Francisco skyline, while suites get you the acclaimed St. Regis butler service. Guests can indulge in the exquisite and extensive menu at the Michelin-starred Ame, or explore the locally sourced fare at Vitrine. The luxurious Remede Spa offers a range of treatments, while a fitness center with an infinity lap pool and gorgeous city views remains accessible round the clock. St. Regis also has a 24-hour business center with large indoor and outdoor event spaces. 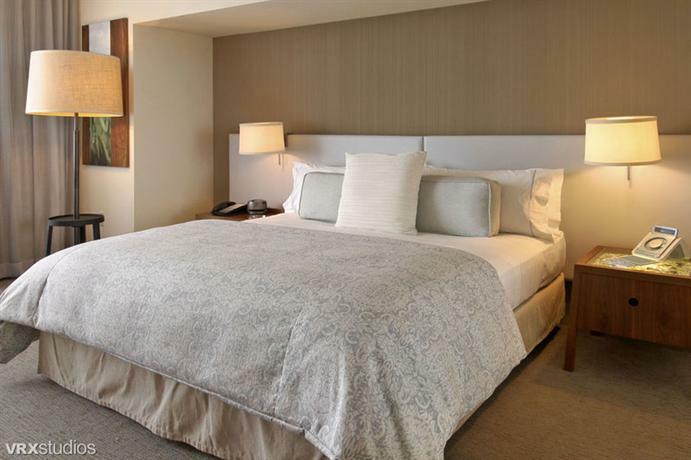 An upscale modern hotel located in the happening SoMa neighborhood, Four Seasons Hotel San Francisco is a great choice for those looking to explore the city, as well as those looking to stay in and be pampered. 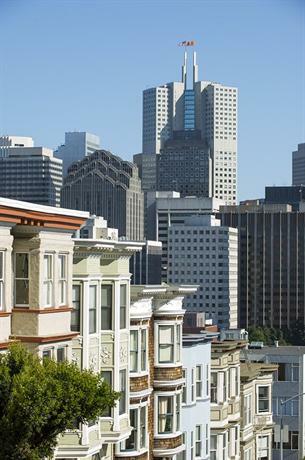 Conveniently set in Market Street, the hotel is right opposite the Yerba Buena Gardens, well within walking distance of Union Square and the Ferry Building marketplace, and well-connected to all other sightseeing destinations in the San Francisco Bay area. 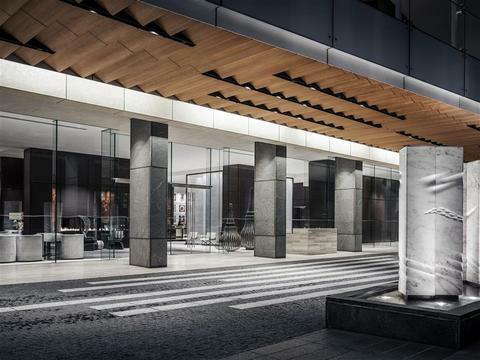 The luxurious Four Seasons Hotel operates out of a sophisticated modern high-rise building, its stylish interiors accented by a fine collection of contemporary art. Rooms are chic, comfortable, and fitted with floor-to-ceiling windows for fantastic views of the city. They are well-equipped with flat screen TVs, iPod docks, coffeemakers, stocked minibars and free Wi-Fi. Suites have soundproofed windows and separate living/dining areas. Premium variants located on the upper floors offer panoramic city views and interiors that are thoughtfully designed for both busy executives and holidaying families. 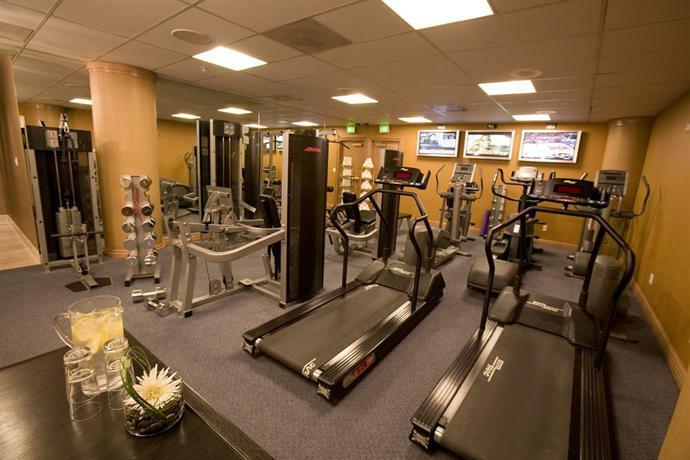 Guests at Four Seasons Hotel San Francisco enjoy free access to the neighboring Equinox sports club and fitness center. Within the hotel is a well-appointed business center with space for large events, and a stylish resto-bar with a unique, California-focused food and drinks menu. Lacing your San Francisco holiday with equal measures of urbane sophistication and natural beauty, Loews Regency has rightfully earned its popularity with tourists. 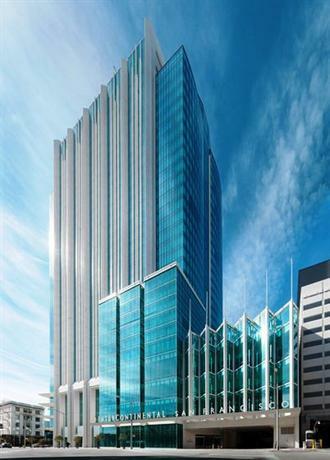 Located in the heart of the Financial District, the hotel functions from the top 11 floors of an iconic high-rise building. From this vantage point it is able to offer breathtaking bay and city views, together with proximity to the Embarcadero station, the Transamerica Pyramid, Fisherman’s Wharf, Union Square and the Ferry Building. Loews Regency San Francisco has 155 guest rooms and 7 suites with chic, airy interiors, the finest of mod-cons, 47-inch flat screen TVs with on-demand movies, free Wi-Fi, iPod docks, designer linen and toiletries, and beautiful San Francisco views framed by picture windows. Some suites have their own terraces. Guests at Loews Regency can avail of 24-hour room service, along with round-the-clock access to the hotel’s business center, gym and spa. The in-house Brasserie S&P serves a curated range of California cuisine, along with craft cocktails and fine wines. 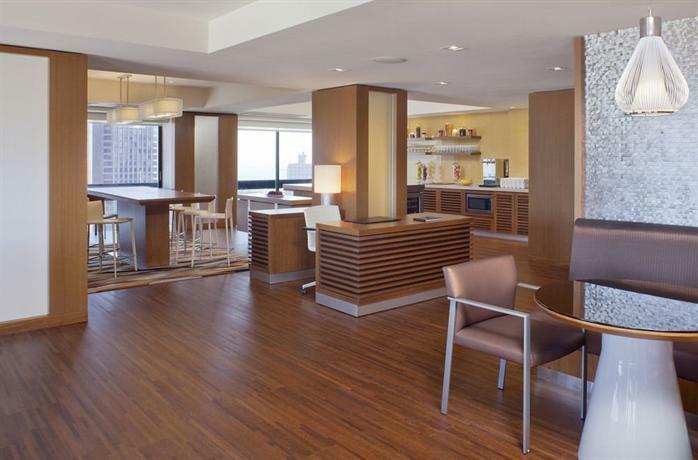 There are sprawling meeting spaces here for large events, including the hotel’s majestic 40th floor deck. A boutique hotel with a setting to match its gorgeous ambiance, Hotel Vitale is located on the Embarcadero, thus offering unparalleled views of the waterfront, the Bay Bridge, and Downtown San Francisco. The Financial District and the Ferry Building are just minutes away, along with some of the most exclusive restaurants and shopping options in the city. Hotel Vitale welcomes guests into an atmosphere of unfettered luxury. Its lavish rooms have soothing color palettes, floor-to-ceiling windows with sheer curtains, comfortable furniture, fine linen, minibars stocked with delicacies, and spa-style limestone bathrooms with signature toiletries. The hotel’s luxury top-floor spa is one of its highlights, along with its Italian resto-bar that has indoor and terrace seating. Coupling a fantastic Fisherman’s Wharf location with a distinctive, boutique ambiance, Argonaut Hotel is a San Francisco destination in itself. Housed in a 1907 building that was once the Haslett Warehouse, it sports an off-beat maritime character and a seamless visual connect with the bay. Spacious guest rooms and suites showcase original exposed brickwork and wooden details, together with a modern overlay of stylish furniture and gadgetry. Guests can marvel at San Francisco Bay views, order in-room spa treatments, or host a private catered reception at the adjacent Blue Mermaid Chowder House & Bar. The hotel’s restaurant serves award-winning seafood in a lovely alfresco ambiance. 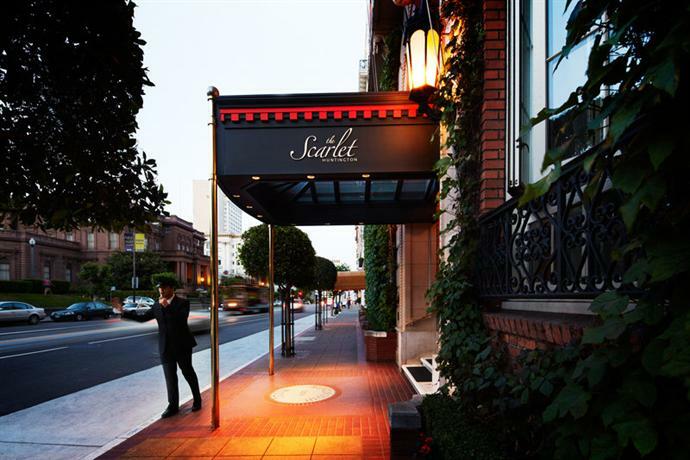 A boutique hotel and a San Francisco landmark all in one, the Scarlet Huntington crowns Nob Hill, in the heart of a famous old district with the cable car line and the Grace Cathedral for neighbors. This hotel has an eventful history, having started out in 1924 as a residential building, before serving for decades as the Huntington Hotel, and finally being acquired by the Singapore-based Grace international chain. Interiors here showcase a fine mix of vintage San Francisco elegance, vivid Asian elements, and premium modern luxuries. Guests can take their pick of accommodation – classic rooms resplendent in velvet, silk and leather, renovated variants sporting sleek modern looks, and 2 gorgeous suites with a stellar blend of both. Other perks include a clubby restaurant and a 3-level spa with an infinity pool and hot tub. An upscale Downtown San Francisco Hotel, Omni is conveniently located near Chinatown, North Beach, the Exploratorium museum, Market Street, and cable car, metro and bus stations to take you just about everywhere in the city. True to its Financial District setting, the hotel operates from the premises of a former bank, retaining its predecessor’s high marble countertops, mahogany finishes and stately vibe. To these it adds an overlay of contemporary mod-cons, giving its large imposing spaces an inviting makeover. Spacious, quiet and well-lit rooms have large desks, armchairs, and comfortable beds, together with thoughtful touches such as full length mirrors and Keurig coffeemakers. 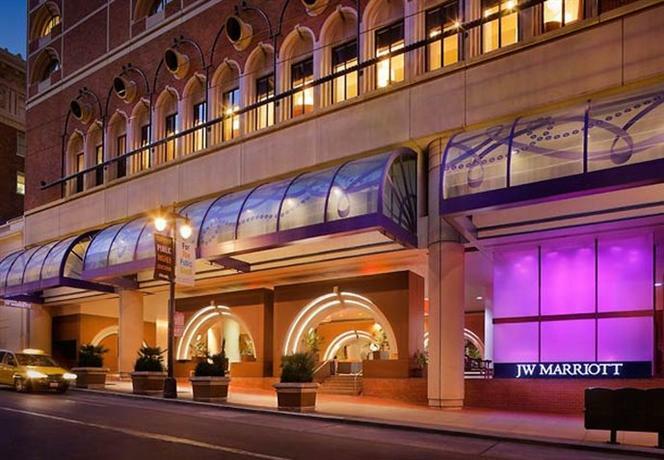 Omni Hotel has a steakhouse, a casual bar, a 24-hour fitness center, and a well-equipped business center. Rubbing shoulders with the trendy SoMa neighborhood and the bustling Financial District, the Palace Hotel on Montgomery Street is a Downtown San Francisco landmark. Housed in a sprawling historic building, it proudly showcases turn-of-the-century details including crystal chandeliers, plush upholstery and Italian marble floors. As many as 550 rooms welcome guests into their grandiose interiors, complete with bold patterns, rich fabrics and dark furniture. The hotel’s famous Garden Court serves breakfast, lunch and afternoon tea. Guests can also pamper their palates at Maxwells steakhouse, or while the hours away at the hotel’s acclaimed and much-loved bar. 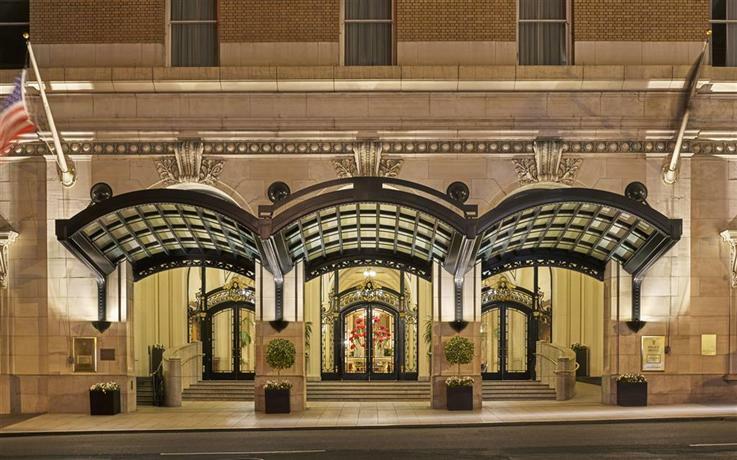 This luxury Union Square hotel is ideal for traveling executives and vacationers alike. Its strategic location places you minutes away from the most happening parts of San Francisco, all accessible on foot or via Caltrain. Rooms here are stylish, featuring soothing color tones, plush beds, flat screen TVs, minibars and Bose sound systems. Round-the-clock butler service is available for a fee. Premium rooms offer impressive city views through arched windows, while a special range of club rooms gives you exclusive access to the hotel’s lounge. A hip cocktail bar, an upscale restaurant, a gym, and an ultra-spacious business center are some of the other treats that the JW Mariott San Francisco offers. Optimized to give you a hip San Francisco experience, the stylish Hotel Zelos enjoys a corner location in the SoMa district, minutes away from Union Square, a BART station, and the culturally vibrant Yerba Buena Gardens. Interiors of its public spaces and guest rooms are chic, urbane and sophisticated. Early 20th century architecture makes the 202 rooms much more spacious than their modern San Francisco counterparts, while a completely renovated interior keeps them contemporary, chic and well-lit. 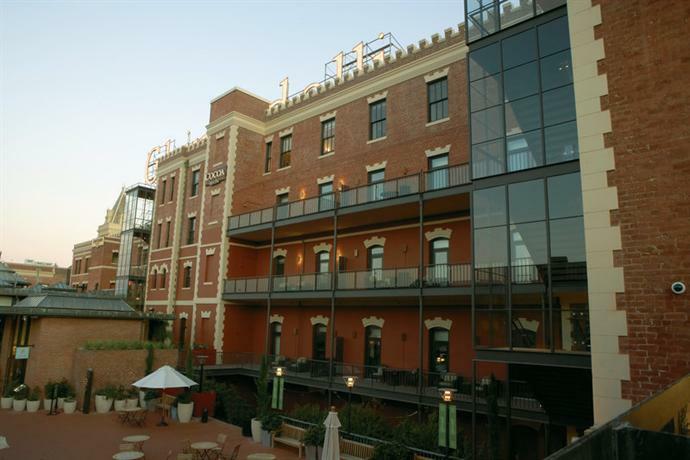 Lovely courtyard and city views are the highlights of the rooms, along with honor bars and signature toiletries. Hotel Zelos offers a range of thoughtful perks, including complimentary morning tea and coffee, evening wine receptions, and the option of participating in planned morning runs. Housed in a sophisticated modern high-rise building just a block away from Union Square, Grand Hyatt is conveniently located within Downtown San Francisco. Moscone Center is a 10-minute walk away from the hotel, and Pier 39 just a couple of miles away. As many as 660 luxurious rooms and suites are up for grabs here, all offering incredible city and bay views, together with free Wi-Fi and great amenities. Some suites have their own kitchenettes. 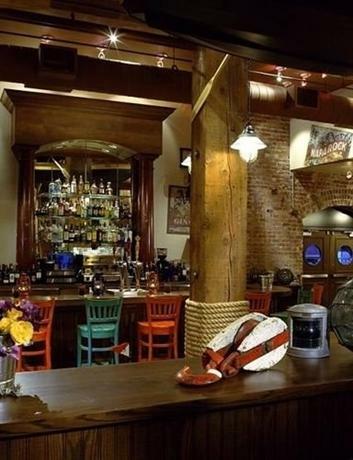 A fine dining restaurant and bar offers a chic bistro ambiance and a delectable menu. Grand Hyatt San Francisco also has sprawling meeting and event spaces, as well as a fitness center with panoramic views. Housed in an iconic modern high-rise, this upscale hotel is located on Howard Street, minutes away from the Moscone convention center, SFMOMA, and Union Square. Its glass-façade exterior encloses plush modern rooms, and suites with their own terraces and panoramic city views. Guests can step into a Michelin-starred fine-dining restaurant, a sophisticated bar, a 24-hour fitness center, and a luxe day spa. 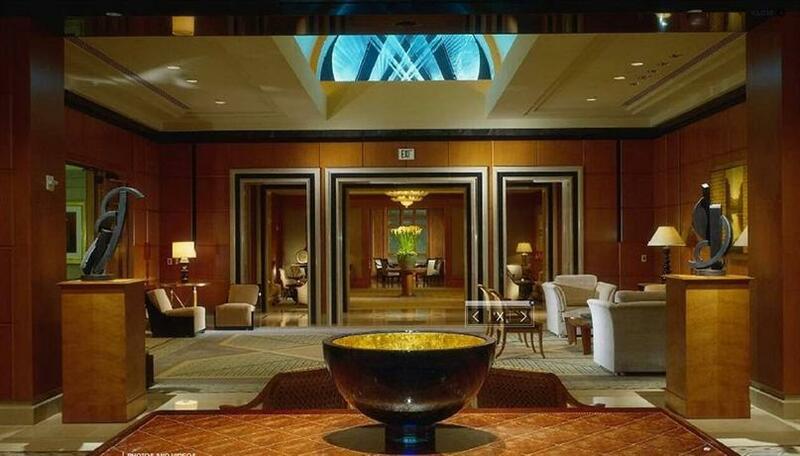 The InterContinental San Francisco also offers stellar facilities for meetings and events, in the shape of its well-appointed business center and grand ballrooms. Part of San Francisco’s beaux arts heritage, and one of its most luxurious boutique hotels, the Marker occupies prime real estate within walking distance of the Union Square. Downtown San Francisco’s best theatres, shopping and dining options form the neighborhood around, and Pier 39 is just 2 miles away. The hotel’s early 20th century grandeur is carefully preserved in its imposing architectural details, and whimsically complemented by the vivid color palettes and bold prints of its 208 rooms and suites. There’s complimentary morning coffee and an evening wine hour. Guests can also treat themselves to Italian fare at the hotel’s restaurant, and craft cocktails at the bar. 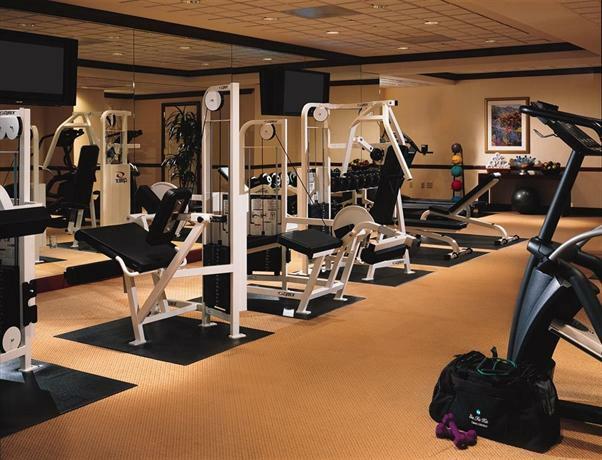 An exercise room and a spacious business center are also part of the hotel.